Various Artists – Grannittin | Esc.rec. Original Grannittin by Robert Witt. Many thanks to all artists involved! Robert Witt graduated in 2005 at the art academy in Kampen (NL) where he started cutting up short sound fragments and using them in installations. After that Robert did some live performances in which he manipulates live input. The input source varies from knitting grannies to sounds emited by ‘ordinary’ surroundings. Robert samples just about anything he finds interesting, such as his own voice, plastic bags, clicks and tics, things out of movies, dutch pirateradio and contemporary music. All this gets fused together in sound collages where the samples become short manipulated fragments. Recognition and amazement are key elements here. The sounds invoke images like an abstract movie soundtrack without the movie. Grannittin is originally a live performance by Robert Witt, in collaboration with ‘Mevrouw de Vries’, an art project initiated by visual artist Anne Reijse, in which all kinds of every day objects are knitted in real size, mostly by elderly women. The live performance consists out of the live manipulation of sounds emited from contact microphones attached to the knitting needles of the knitting ladies present at the opening of a ‘Mevrouw de Vries’ exhibition. 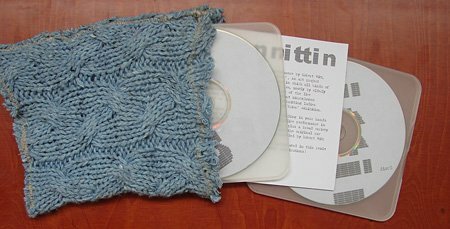 Grannittin is a double cd-r release in a unique package, handmade with recycled knitted fabrics. The two discs contain a registration of the Grannittin live performance in art gallery Het Langhuis in Zwolle (NL), plus a broad variety of remixes by different artists, made with the original raw audio samples of knitting needles, as recorded by Robert Witt.